Not your good old Wild West Cowboys. A sub-genre of The Western, so called because they were produced by Italian studios (and tended to feature quite a bit of gore). These movies were typically shot in Spain, since the Tabernas Desert looks similar to Hollywood's idea of the old west. Since Spanish extras were readily available, Spaghetti Westerns often featured "Mexican" characters and themes, often focusing on the Mexican Revolution, border problems, or Mexican banditos. There was a whole sub-genre dedicated to politically-oriented westerns about the Mexican Revolution called the Zapata Western. 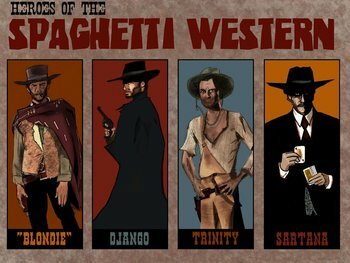 Spaghetti Westerns were originally scorned for their low budgets, fading Hollywood stars, and for its rougher and harder look at common Western tropes, although in general very few of these Westerns were especially political or informed enough about American history to be actual deconstructions, and few of them ended up critically Vindicated by History outside of Sergio Leone's films actually. Nonetheless, the greater violence, rougher and harder aesthetic, gave spaghetti westerns an integrity entirely at odds with the glossy and stagey Hollywoodian Westerns and in time, the visual aesthetic of the spaghetti westerns later became staples of the genre. Most notably, the spaghetti Westerns provided the staging grounds for the last great icon of the Western genre: actor/director Clint Eastwood, who was a TV and B-Movie actor in America before his appearance in Sergio Leone's films made him into a major movie star. Fist of the North Star is a classic Japanese Anime that has been deeply influenced by the directorial style of Sergio Leone, right down to the violence-torn desert wasteland setting (albeit a futuristic one) and the mournful musical style of Ennio Morricone in its more thoughtful scenes. Taken even further by another post apocalyptic anime, Combat Mecha Xabungle. The desert landscape and several characters dressed like cowboys or banditos give the show a Wild West feeling, but according to maps, at least the ones shown in its Super Robot Wars appearances, the action takes place in Southern Europe. Jo Jos Bizarre Adventure Steel Ball Run, being a story about the friendship between two violent, amoral and cynical cowboys questing across the desert of the final frontiers, is a super-powered (and fabulous) love letter from Hirohiko Araki to For a Few Dollars More of the blood-soaked and tragic Dollars Trilogy by Sergio Leone. Point in fact, The Man With No Name played by Clint Eastwood in said trilogy is the primary inspiration in appearance and attitude for Kujo Jotaro, the protagonist of JoJo's Bizarre Adventure: Stardust Crusaders, the third part of the saga. Upon finding out this, Eastwood met and befriended Araki, becoming a fast fan of the Jojo Franchise. In what may be the Spaghetti Western tradition coming full circle, the Tabletop Card Game Bang! was created by an Italian designer and set in the Wild West. Borderlands features vast desertscapes, dangerous fauna, a band of Anti-heroes, a population of Axe-Crazy convicts, the occasional small town and loads and loads of guns, oh and a big fat treasure at the end of the story, either sought or disbelieved by all. The 2011 film Rango is practically a love letter to this genre of film, featuring numerous shout outs in its plot to films of days gone past, mimicking the cinematography typical of its genre and even featuring a cameo of an animated version of the Man With No Name as the "Spirit of the West". Flying Swords of Dragon Gate is a Chinese Wuxia film staring Jet Li that is openly influenced by the melancholic and violent world of Sergio Leone; being set in the mournful and windswept deserts of Shing Jiang province really helps. The Quick and the Dead is basically a Martial Arts Tournament (think Enter the Dragon) fought with quick-drawn revolvers. Made by Americans, yes. But its corrupt, wind-swept and decaying wasteland punctuated with a mournful Ennio Morricone inspired soundtrack hits the genre's nail right on the head. The Good, the Bad, the Weird is a more humorous and action-packed Korean Remake of The Good, the Bad and the Ugly, set in the 1930s Manchuria. Kelly's Heroes is basically a Spaghetti Western set in World War 2 France, complete with Clint Eastwood! Quentin Tarantino's Inglourious Basterds has a number of spaghetti western elements to it. Django Unchained follows the genre a lot more closely, considering it actually is a Western. Not to be outdone, Kill Bill also has several shout-outs, including reusing a lot of music from this genre. The Hateful 8, while very much not in the style of a Spaghetti Western, takes several important cues from the genre. The Boktai game series features a number of spaghetti elements, most notably its gunslinging protagonist, Django. The second game in the series was by far the most heavily influenced by the genre, but then the influences were downplayed significantly for the third game as well as the In Name Only follow-up Lunar Knights. The second act of Red Dead Redemption is one of these, complete with a Mexican setting, Black and Grey Morality, and the increasing prominence of John Marston's Anti-Hero side. El Tigre contains many characters, plots, and themes inspired by the genre. The most notable is Sergio, an Italian kid who moved to Mexico in hopes of being a cowboy. The Cowboy Bebop episode "Cowboy Funk" is an Affectionate Parody of the genre (and of The Western in general). GUN×SWORD is what happens when giant robots arrive in a spaghetti western. Samurai Jack, while not a direct inspiration, borrows heavily from the genre, especially the Dollars Trilogy: a lone warrior of few words, known only by his nickname, passes quietly through various places, defeats the bad guy and then moves along. Phil Lamarr even described his voice for Jack as being a Japanese Clint Eastwood. Avatarthe Last Airbender Zuko Alone: Anti-Hero traveling incognito comes to a lawless village on the frontier, a place oppressed by local soldiers little better than bandits and populated by apathetic/ungrateful townsfolk. Violence and resentment ensue, and he rides off as isolated and frustrated as before. Unusually for this style, the audience not only knows more about the traveler than the townsfolk do, but we learn even more about his backstory in this episode.